Nothing New Under the Cinematic Sun? I finally saw Avatar. I realize it’s been out for months and earned an obscene amount of money at the box office, but I have a thing about crowds and prefer to wait until the hype has died down before I see a blockbuster like this in a movie theatre. I must say that James Cameron’s film certainly lives up to it reputation in terms of visual spectacle. The scenery is indeed dazzling, and the 3-D effects will likely spawn dozens of imitators for years to come—which is only fitting, since imitation is pretty much all you get with Avatar in terms of its storyline. Granted, it’s nothing new for artists to build on the work of their predecessors. George Lucas freely admits that he dove deep into the archetypal pool (via Joseph Campbell) when scripting out his Star Wars saga. Likewise, the Wachowski brothers drew from a host of literary and religious archetypes when they created the Matix trilogy. However, Cameron does not pay homage to these traditions so much as he downright steals from the work of other screenwriters and filmmakers. While watching the three-hour long Avatar, I found myself making a mental checklist of the cinematic allusions being played out on the screen. Dances With Wolves is there in bulk, as are the aforementioned Star Wars and Matrix movies. There are also echoes of Braveheart, Pocahontas, Medicine Man, Independence Day, Donnie Brasco, Apocalypse Now, The Search for Spock, Total Recall, and Kingdom of Heaven. Cameron even seems to borrow from himself a bit with nods to the Alien and the Terminator franchises. Plus you get a movie with Romeo and Juliet-esque star-crossed lovers and a narrator who is divided between two worlds—much like the protagonist in The Chronicles of Thomas Covenant novels. Don’t get me wrong, many writers have built careers based on adaptations of other people’s ideas (William Shakespeare comes to mind), and James Cameron’s film is worth the price of admission if only to admire the work of a talented team of animators. 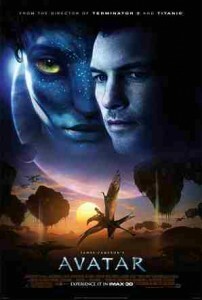 But without the stunning visuals, Avatar’s storyline seems a bit shallow. Then again, this is Hollywood we’re talking about, and in a country whose reading habits continue to decline, perhaps movies are the only form of cultural transmission we have left.